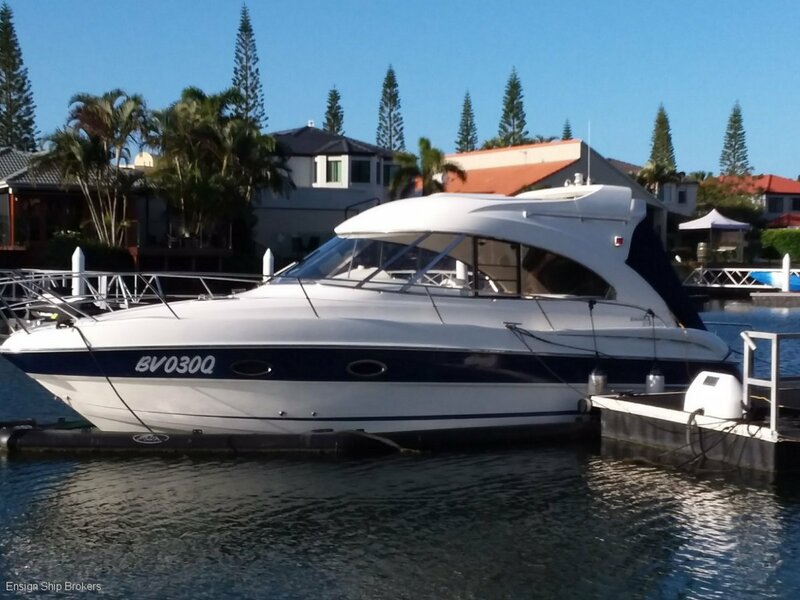 This Bavaria 30 Sport HT is sure to impress and is loaded with a list of Factory Options! 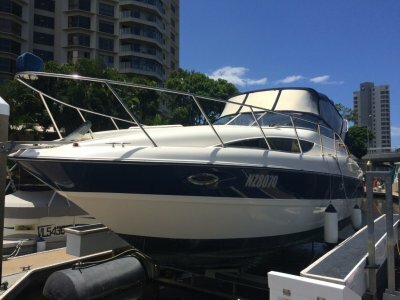 The current owner purchased this boat new from us in 2008 and ticked numerous boxes when it came to options and packages. This is a Factory Hard Top version with an electric sliding sunroof. A turn key package that includes a Sea Pen for this great price having travelled a mere 43 hours, yes, not a misprint, 43 HOURS ONLY! The owner has just spent a substantial amount of money on this boat on our recommendation so now has had both legs rebuilt and had the starboard engine removed to have the transom shield replaced, work is now completed and the boat is ready to go! Anodes have also been replaced. This Bavaria is a pleasure to drive and is effortless to park with the joystick. This beautiful Sports Cruiser is fitted with twin 5.0 MPI Mercruiser Seacore Freshwater Cooled Engine with Bravo Legs, and yes, also has Mercury Axius Joystick along with Digital Controls for effortless mooring in any weather or confined space, it doesn't get any easier than this! 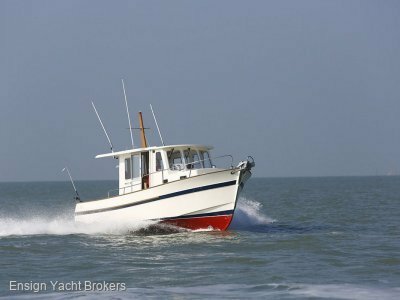 The photos do not do this vessel justice, it is a must to inspect and I am confident that the first to view this boat will become the new proud owner. 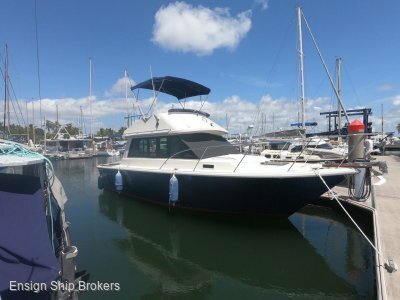 This Bavaria has never been antifouled as it has always been housed in the Sea Pen and to make this boat even more appealing it is Fresh water cooled and has the added bonus of a fresh water flushing system for both engines that were fitted from new. On board you will be immediately impressed by the overall condition of both the cockpit area and down below in the cabin, the interior space presents "As New", the roomy wrap around lounge sits above the electric engine hatch, moving forward you will notice the Wet Bar and Factory optioned Fridge. Seating adjoining the impressive helm is extremely comfortable with side windows and plenty of natural light and airflow from the electric sunroof. Moving on to the helm you will be overwhelmed with the great layout of gauges and controls, to the starboard side of the steering wheel you will find the Axius Joystick Control complimented by the Electronic Controls and Smart Craft Engine Management System and Vessel View Screen, Gauges are clear and placed perfectly for effortless boating enjoyment! Moving down the stairs below deck you will be immediately impressed by the fantastic timber finishes and soft furnishings that will impress any discerning buyer. A forward convertible Dinette makes a great size double bed in the V Berth with ample storage throughout the cabin, the mid cabin also features a double berth and also has plenty of storage and natural light and ventilation. The Galley is well laid out and features a 2 burner alcohol stove that has never been used along with a Factory Fitted Waeco Fridge/Freezer that has also seen little to on use alongside is a good sized sink with hot and cold water. The bathroom is also well thought out and uses the space well with a toilet and shower. This is an ideal family boat with a fantastic outdoor space and extended swim platform with swim ladder, a really great entertainer. 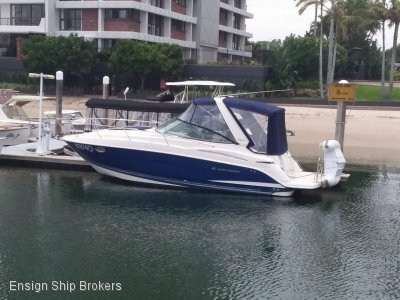 Our Vendor has priced this boat very sensibly for an immediate sale @ $149,000 inc Seapen. Call now to avoid the disappointment of missing out on this great turn key package.